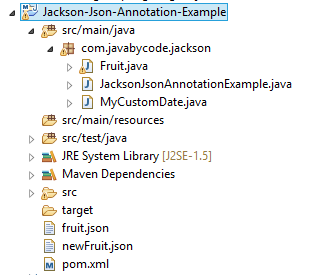 This tutorial introduces about JSON Annotations via Jackson JSON Annotation Example. Jackson JSON Annotations are implemented exactly as approach read and write of JSON data-binding. But the different point is properties of POJO are annotated at running time. The jackson-databind provides ObjectMapper API and the jackson-annotations provides JSON annotations. 1) @JsonProperty : This annotation is used on a property or method. it provide mechanism for Serialization and Deserialization of JSON. 2) @JsonIgnoreProperties : This Class level annotation is used to ignore certain properties to be serialized & deserialized. It means that they will not be mapped to JSON content. 3) @JsonAnySetter, @JsonAnyGetter : Two annotations are applied on Getter/Setter methods working with a Map. @JsonAnySetter will catch JSON value which is not mapped to a property in POJO class and deserialized(stored) into Map. These annotations works as a Catch-All and are applied on Getters/Setter working with a Map. If there is any JSON value which is not mapped to a property in POJO, then that value can be caught by @JsonAnySetter, and stored (deserialized) into Map. Similarly @JsonAnyGetter will serialized all values which are stored into Map back to JSON. 4) @JsonSerialize : This annotation is used to customize the default serialization (Java to JSON) process. In case the default serialization is not matching your needs and you should customize it for your requirement. In this Jackson Json Annotation Example, Instead of showing default format of a property we can declare a Custom Serializer to serialize with desired format. Here, we create Customer Serializer and annotate it for importedDate property. The main class is quite simple. We read from a file and deserialize the input JSON into a POJO object using ObjectMapper readValue. Then we serialize that POJO object using ObjectMapper writeValue and write the JSON data to a file. That’s it on the tutorial Jackson Json Annotation Example. If you find any error on this tutorial, please leave comment.